(CNN) -- Belgian cycling star Tom Boonen had double cause for celebration after winning the third stage of the Tour of Qatar on Tuesday. 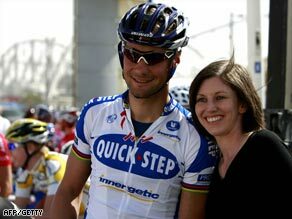 Boonen poses with a fan before the start of the third stage of the Tour of Qatar. His victory came after a Belgian court ruled he would not face criminal charges after testing positive for cocaine last year, the Flemish newspaper De Standaard reported. The former world champion risked between three and five years in jail if the matter had been referred to a higher criminal court, but instead he is on three years probation, the newspaper said. Boonen was unable to race in the Tour de France and world road race championships in Switzerland last year after the positive test became public and the court said that was punishment enough. Quick Step star Boonen has enjoyed considerable success in the season-opener in the Emirate state and again showed his sprinting quality at the end of the 140.5 kilometer stage from Al Zubarah to Doha. He held off Italian Danilo Napolitano and Juergen Roelandts of Belgium to claim the 10-second bonus for the stage victory, which was his 15th in the event, which he also won outright in 2006. Britain's Roger Hammond (Cervelo) finished in the leading group, but had to give up the overall lead to the Belgian. He trails by six seconds with Heinrich Haussler of Germany in third place at 14 seconds. Boonen was expected to come under challenge from another Briton, Mark Cavendish of Columbia High-Road, but he again finished off the pace and did not contest the sprint. Many of the leading European cycling teams are using the annual event in Qatar to prepare for the upcoming season, but strong crosswinds have made the racing tough despite the predominantly flat terrain.